Ten pages of your views. Your chance to win Funk Firm's superb new FXR II tonearm, worth �1,175! Our guide to the latest and greatest hi-fi hardware on sale. This new high end DAC gets the David Price treatment. David Price is beguiled by this wonderful sounding high end SACD spinner. Noel Keywood finds these floorstanders to have more than a little Gallic charm! 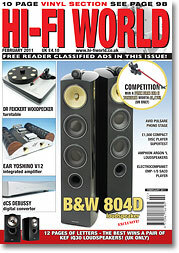 These fine high end floorstanders are reviewed by Noel Keywood. David Price is impressed by these clean living Scandinavian loudspeakers. Noel Keywood samples this glorious valve integrated amplifier. Paul Rigby finds this budget power amplifier most excellent value. Adam Smith tells the tale of Empire's classic 598 turntable. Paul Rigby has all the latest black plastic releases. Rafael Todes spins up this superb high end turntable. Tony Bolton is most impressed by this flagship phono stage. Tim Jarman reports on an impressive B&O cartridge rebuilder. Paul Rigby has another seminal recording for you.